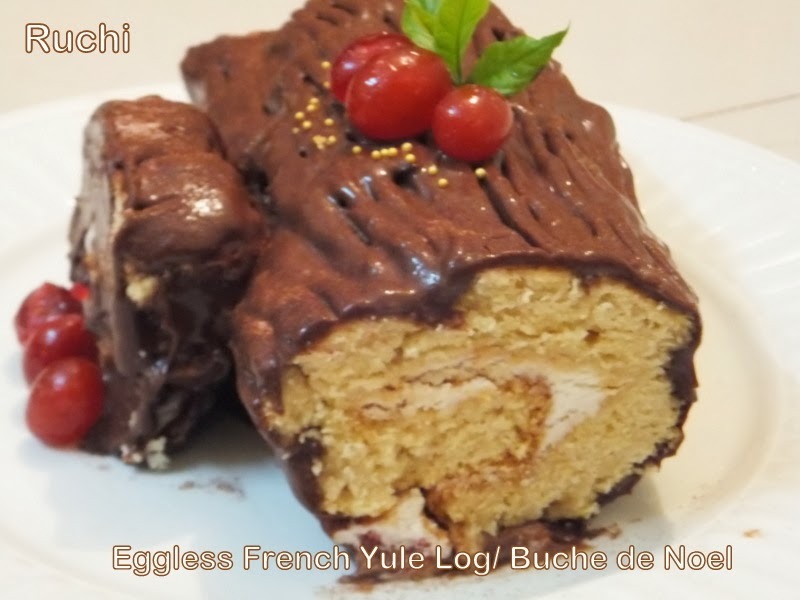 Yule Log cake is one of the most popular traditional cakes made for Christmas. 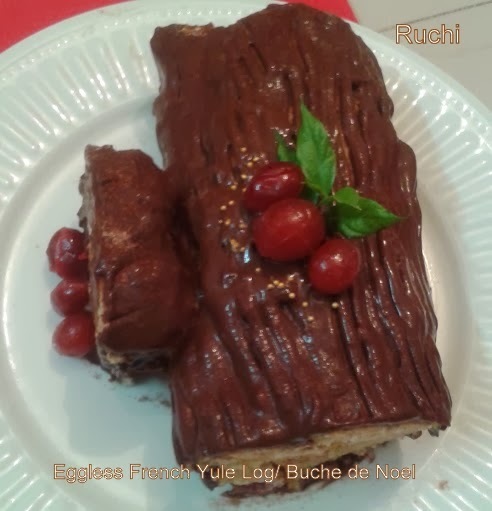 This is commonly referred to as Buche de Noel. 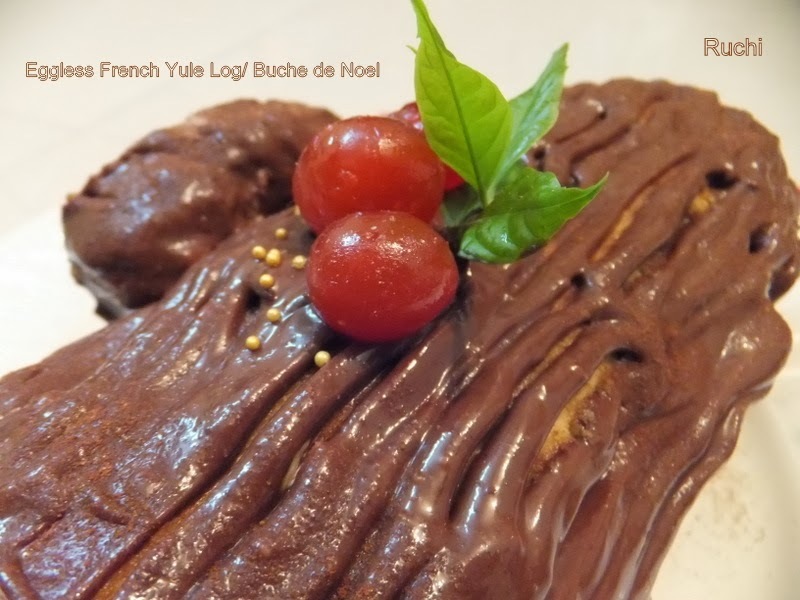 The alternate term for the Yule log cake is Buche de Noel, which is French and indicates that the cake has its origins from France, one of the culinary capitals of the world. The term translates to the literal term "Christmas Log". Christmas logs or Yule logs were placed in the fireplace hearth and burned centuries ago as part of the holiday tradition for Christmas, commonly on Christmas Eve. Traditional Bûche is made up of sponge cake. It is baked in a shallow pan, filled with chocolate buttercream and rolled in to a log. It is frosted again with chocolate buttercream, refrigerated and served cold. This is my first attempt and it came out well. 1. Take Maida, Baking Powder, Baking Soda together. Sieve it in a large bowl. 2. Take a deep bowl or container and pour melted butter in it. Add condensed milk to it and stir it nicely with a wooden spoon or a hand mixer. Then add milk and mix for another 2 minutes. 3. To this mix add the sieved dry contents. Add the Vanilla essence and give it a good stir for a minute so that everything is uniformly mixed. 4. Keep a cake baking pan greased with butter and dusted with flour ready before starting to make the cake batter. Pour the cake batter into it. Insert the cake pan into preheated oven. Bake the cake at 180 degree C for 20-25 min. 5. While the cake is baking, spread out an impeccably clean kitchen towel on a counter space and sprinkle it with cocoa powder. 6. To ensure that the cake is done, insert a tooth pick into it. The tooth pick has to come out nice and clean. Switch off the microwave. 7.. When the cake comes out of the oven, immediately run a sharp knife along the edges of the pan to loosen the cake hen quickly flip the pan on top of the cocoa-powder-topped towel. 8. While the cake is still warm, gently roll it up using the towel, so that the cake doesn’t stick to itself but is rather rolled up with the towel where filling would be and Let it cool, rolled up, for about 30 minutes. While the cake cools, prepare your whipped cream filling and topping. Start with the whipped cream. In a chilled mixing bowl, vigorously whip 1 cup whipping cream, 2 tablespoons of sugar, and vanilla extract until stiff peaks form. Store in the refrigerator until you’re ready to assemble the cake. Make the ganache topping next. In a medium saucepan, heat 2/3 cup of cream over medium-low heat until it reaches a low boil. Stir every now and again to prevent it from scalding. Once it reaches a low boil, remove from heat. Add the chocolate to the cream mixture and stir until smooth. Let the chocolate mixture stand until it begins to firm, about 30 minutes, before icing the cake. Unroll cake carefully, and remove towel. Brush the simple syrup over the cake. Then spread whipped frosting evenly over cake; roll up cake. Refrigerate the cake for at least1 hr. Take cake roll from refrigerator and place it on cooling rack; frost cake. Using the rest of the ganache, ice the cake on the sides (and if desired, on the ends, or you can keep them un-iced) and all over the stump. Gently drag the tines of a fork along the surface of the ganache to give it a “woody” appearance. Let stand 15 minutes. Transfer cake to serving platter. Slice it up and serve. fantastic yule log. Merry christmas dear. Delicious Yule log. Visit me too dear when you can.